The launch of the Samsung Galaxy Note last year surprised many by combining the features of both smartphone and tablet, and signalled a new advancement in innovation for Samsung's mobile devices. 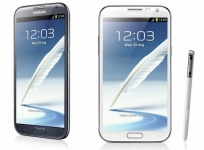 Now, buoyed by the success of the first Note and inspired by the innovations of the Samsung Galaxy S III, Samsung has released the Samsung Galaxy Note II, which is bigger, faster and packed with even more fun, creative features. At the recent launch in Kuala Lumpur, invited guests and media were given a special preview of the Galaxy Note II, including first-hand accounts from three users - local TV host Adam C, actor/host Razif Hashim and Lithuanian artist Ernest Zacharevic, famous for his murals in Penang. 1) 5.5-inch HD Super AMOLED screen, which allows users widescreen video viewing up to the 16:9 ratio. 4) A massive 3,100mAh battery for longer usage. 5) 8MP rear camera and a 1.9MP front facing camera with HD video recording. For those who work on the go, there is the new Multiwindow function, which allows users to run two apps side-by-side on the screen, allowing them to check their mail, surf the internet or take down Notes - multitask. The new Air View feature also allows people to preview content by hovering their S Pen over icons, letting them preview photos, videos and other content without wasting time clicking and opening apps. Users who enjoy photo-taking also have a new function to play with called Best Face, which allows you to always get the best picture from group shots. Anyone who's ever taken a group photo that had at least one person blink or look away will appreciate the Best Face feature, which takes a rapid succession of five shots, and then lets you pick and save the 'best faces' of the five photos into one master photo. The S Pen itself has also been redesigned to have a more streamlined body and to deliver a more precise writing experience. It also has more functions, letting users crop content in any shape with the Easy Clip feature, and writing notes on the back of photographs with the Photo Note function. There are also a multitude of Quick Commands that lets users take shortcuts with the S Pen. This is especially good for artists, who can change drawing tools and colours without lifting the S Pen from the screen. With so many new features packed into the device, it's no wonder that Samsung executives are enthusiastic about the device, especially Samsung Malaysia Electronics managing director Kwon Jae Hoon. He said at the launch: "It (The Galaxy Note II) is a device infused with capabilities to help people unleash their creativity at work or at leisure. This device is designed to help people harness their individual creativity, allowing them to live a life extraordinary." The Samsung Galaxy Note II is available in Marble White and Titanium Grey from Samsung partners, as well as via Celcom, DiGi and Maxis mobile plans. It retails for RM2,299.